At Xlab on October 28, interaction designer Nils Wiberg of Gagarin will lead a not-to-be-missed visionary exploration of next generation interactions. Register now! 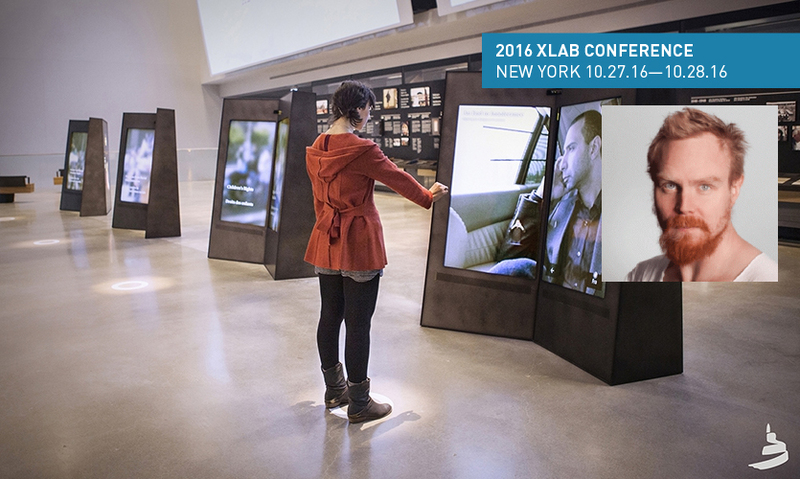 Xlab is designed to provide guidance and provoke a response to rapidly evolving factors in experience design. New models of interactive experiences are already emerging that impact our projects, spaces, cities and our lives. As part of the program on October 28 in New York City, interaction designer Nils Wibergof Gagarin (Reykjavik) and Tali Krakowskyof Prophetwill lead a not-to-be-missed visionary exploration of next generation interactions. Nils Wiberg’s talking points will generate a lively discussion on new ways of thinking about human behavior and interactive design. How do the proliferation of technology and our increasing social connectedness bring at least the promise of an Internet of things? How are the 2010 stock market flash crash and Amazon Echo jumping “on-topic” into your social conversation useful examples to designers of how algorithms adapt and change states in reality? How do interaction designers make the same experience thrilling, tedious, provocative, informative, etc. and also define how the experience is remembered, how long it is remembered and if it changed someone's mind or perspective? Wiberg also wants to get participants thinking about the designer's responsibility towards both the intended and unintended consequences of their designs. "A designer working with interactivity and digital technology gets to decide what happens and when it happens. If a goal of design is to change an end user's perspective on something rather than just being a retinal afterglow created by the familiar confetti of modern technologies, one has to dive deeper into the issues at hand." Always seeking innovative solutions to interactive design, Wiberg's work on three permanent exhibits at the Canadian Museum for Human Rightshelped to win Gagarin not only a Merit Award in the 2016 SEGD Global Design Awards, but also the 2016 Sylvia Harris Award. One particular aspect of the interactive experiences there is innovative software Wiberg created where the interactivity becomes more immersive in response to the visitor's presence—in effect, a reciprocal relationship is developed through which the visitor and the museum inform each other. Wiberg is experienced working with a multitude of media, interfaces, devices and technologies and he has given numerous talks on these subjects to help prepare designers, innovators and society at large for new realities in experiential design. He believes true innovation in the field comes from paying attention to evolving human behavior and, as is evident at the Canadian Museum, that interaction design has the ability to reshape and redefine behavior in a broader sense than just with digital artifacts and systems. This Xlab will include other thought-provoking sessions on topics of current interest such as The Digital City: Creating New Ecosystems with George Burciaga of Civiq Smartscapes and Mike Rawlinson of City ID and Experiential Content: Connecting to Placewith Chad Hutson and Ellen Schopler of Leviathan and Refik Anadol of Refik Anadol Studio. Check out the complete schedule of courses and networking sessions, as well as tours and workshopsat Xlab: Digital Innovation and the Future of Experiential Design. Don’t miss this amazing learning and professional development opportunity with Nils Wiberg and other leaders of the SEGD community—registernow!